The fourth and final week of the Hum Residency at Manhattan Inn was in many respects a fitting close to this excellent and unique concert series. The crowd for this night was the largest of the entire series and the music was as superb as expected. Jen Goma (A Sunny Day in Glasgow) returned from last week, but this time in a trio with Cassandra Jenkins and Caroline Davis from Maitri. The trio began the night with a cold start of an acapella number that quickly quieted the crowd before Rachael from Hypnocraft introduced the artists. The first set was truly a remarkable display of three-part harmonies and collaborative songcraft from three outstanding artists. For the second set, we were again treated to music from Cat Martino, who has appeared many times on the pages of this website, this time with the multi-talented Erin Fein from Psychic Twin. This set was a five song affair that consisted of alternate numbers from the two protagonists that featured ethereal vocals and keys and effects that worked well in unison. The final song was a moving and poignant solo number on the house piano by Cat Martino that was striking not only for the beauty of her voice but the raw emotion it conveyed. The final set paired the indescribable artistry of Xenia Rubinos with the guitar masterwork of Indigo Street. The trio was joined by multi-instrumentalist and avant jazz performer Shahzad Ismaily on drums. This grouping was perhaps the most inspired mix of talents of the entire four-week series. Xenia’s ability to create compositions from whole cloth was on display as the set consisted primarily of improvised material. This format also suited the talents of Indigo Street as her guitar work, even in the improvised segments, was precise and entirely on point. The evening and the series were served well by this incredibly strong closing set and we could not be more pleased to have captured it, and every note of the month-long event. I recorded this night in the same manner as the previous week’s sets — with microphones set up within the area of the music and mixed with a board feed consisting primarily of vocals. This week I used the Sennheiser cards on the floor. The sound quality is superb. Enjoy! The first three installments of this excellent series were recording and posted on nyctaper here, here and here. 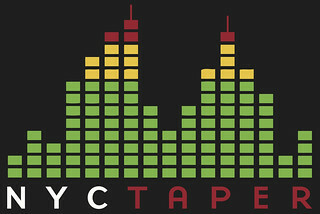 If you Download these Sets from NYCTaper, please support these artists and their bands: A Sunny Day in Glasgow, Cassandra Jenkins, Maitri, Stranger Cat, Psychic Twin, Xenia Rubinos and Indigo Street. The third week of the Hypnocraft-presented Hum Residency at Manhattan Inn was my own personal first experience with this extraordinary mesh of talents and it was a terrific night. The first set was scheduled to be a duo with our old friend Alyse Lamb from EULA with Alex Nelson of Oracle Room but the group became a trio with the addition of Pamela Martinez (of Teletextile), a veteran of the first week of Hum, on percussion, keys and effects. Their set was a shared group of songs that neither protagonist has ever performed live before, and for Alyse the material was more aligned to her solo project Parlor Walls (who we recorded last year) than to the hard-driving post-punk of EULA. The second set was performed by another old friend, Jen Goma of A Sunny Day in Glasgow, who has previously appeared on NYCTaper a couple of times. She was joined by Teeny Lieberson (TEEN) and Zoe Brecher (Brainfreeze) for a set that primarily was fueled by dual keyboards and drums until Jen strapped on the strat for the final number. Overall, this trio’s collaborative effort was reminiscent of the synth-driven pop of the aughts but with stunningly precise harmonies. The final set of the night was a full-on party, which is what we’d expect from a quartet that includes Rubblebucket‘s Kalmia Traver, but which was a true collaboration that also featured Sarah Pedinotti (LIP TALK), Kaila Mullady (champion beat boxer) and Jordyn Blakely (Invisible Familiars). This set included songs written and arranged by all four participants and was a mix of funk and electronica with some amazing harmonies, and also featuring nice bits of baritone sax, beats and some sweet guitar licks. The final song had the whole crowd standing and grooving and ended this fine night in very entertaining fashion. I recorded this show with the Neumann large diaphragm cardioid microphones on the floor in the center of the performers and mixed with a soundboard feed which provided primarily vocals. The mix of the two sources provided an excellent balance and the sound quality is superb for all three sets. Enjoy! The previous two weeks of the Hum Residency were previously posted [here] and [here]. The final week was also recorded and will be posted within the next week. If you Download these Sets from NYCTaper, please support these artists and their bands: EULA, Parlor Walls, Oracle Room, Teletextile, A Sunny Day in Glasgow, TEEN, Brainfreeze, Rubblebucket, LIPTALK, and Invisible Familiars. If you caught last week’s post about week one of the Hum Residency, you already know the deal — Hypnocraft Presents brings us a monthlong, Monday night series held at the Manhattan Inn in Greenpoint, featuring musical collaborations among a diverse range of predominantly women artists, together with live projections. By design, the events have a spontaneous, free-flowing feel to them, with the artists wedged in around the centerpiece of the restaurant’s back room, a large white piano, used intermittently by the bands. Surrounding the artist on all sides are the fans, unsure of exactly what to expect, but knowing it should be something interesting and important. The second week’s lineup was especially diverse, featuring songwriter Deli & Ashley Jackson on harp, the violist and singer Hannah Epperson, folk pop from Elizabeth & the Catapult, and an abstract guitar performance from Indigo Street of Shy Hunters and Shelley Burgon on harp, all of it backed by lush projections by Sofy Yuditskaya. Ashley Jackson began with two solo harp pieces, the second a fascinating version of Angelica Negron’s “Technicolor” with loops added in. Jackson was then joined by singer-songwriter Deli Neblett. Deli, of Nashville, began her very first New York show (!) with a set of guitar songs that felt even more delicate when backed by Jackson’s harp, as Neblett’s voice looped in the background to provide a ghostly ambiance to her arrangements. Her songs have a stylistic daring to them that sets her apart from her peers; the phrasing in “Boating” is hers and hers alone. “Grown Again” may remind you a little of Grouper, but it has a more organic sensibility than her work, despite the loops. Neblett’s future NYC shows should be worth a look. Violinist and vocalist Hannah Epperson felt in command of the situation from the get-go, promising to tame her usual volubility. I’d have been happy to hear her talk more, personally, but her playing belonged as the highlight. Of her two songs, the expressive “Farthest Distance Apart” really nailed it for me, with Epperson’s vocals about the transient nature of attention in modern society sure to hit home with most of us. Then came time for Elizabeth & the Catapult (in this case, the “Catapult” was guitarist/vocalist Chris Cubeta), who let loose with a rollicking, devil-may care kind of a set that found Elizabeth moving between the piano and wandering the stage with her guitar, joining her musical partner for vocals on “Go Away My Lover”, which we first experienced at Elizabeth’s Backyard Brunch Session a couple years ago. Here, Elizabeth sounded more forceful and assured than ever, earning plaudits as well as some deserved laughs for both her all-too-recognizable lyrics about relationships and her equally-deserved hate for hashtagging. Elizabeth & the Catapult’s set was so on point, in fact, that she even got an “encore” of sorts, turning her song “More Than Enough” into a crowd singalong. Perhaps the evening’s most surprising set came from Indigo Street and Shelley Burgon, who closed things down with an intense set of ambient instrumental music that created the perfect vibe for ending the night. Their choices — Burgon’s “Time Between Times Variation Three” and the theme from “To Kill A Mockingbird” — were cerebral, cinematic numbers that were a joy to see being created. They truly created the sort of “hum” this event is about, a warming of the heart, brain and soul, an oasis of reflection capable of taking place even in a crowded bar. It was something special. I recorded this set with a soundboard feed together with Audio Technica 4051 cardiod microphones up close on the performers. While some ambient noise can be heard from the crowded bar up front, as well as bits of DI hum here and there, overall the sound quality of the sets is quite good. Enjoy!